Please join us for a special screening of “NATURE” in the WRAL 3D Theater: “Super Hummingbirds,” followed by an exclusive Q&A with Emmy-winning producer Ann Johnson Prum. 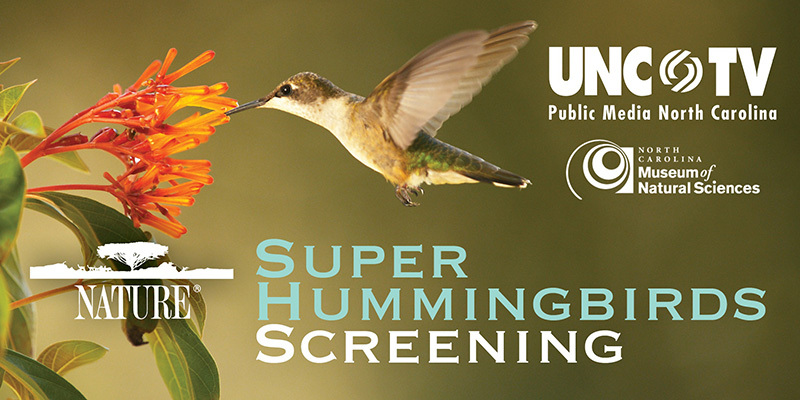 Ms. Prum will introduce and screen her film, “Super Hummingbirds,” and discuss the upcoming “NATURE” special, “American Spring: LIVE” on PBS. Enter the fast-paced world of hummingbirds as never before with high-speed camerawork and breakthrough new science. Possessing natural-born super powers, speed is their middle name and they can fly backwards, upside-down and even float in mid-air. While their lives move faster than our eyes can see, now, for the first time, you can see them mate, lay eggs, fight and raise families in intimate detail. They are great athletes, tender mothers, brave in combat and up for any challenge. They are super hummingbirds: the smallest, most brilliant birds on Earth. “Super Hummingbirds” is a production of “NATURE” on PBS. Ann Johnson Prum has been an independent wildlife cinematographer and media producer for more than 25 years. She is the owner of Coneflower Studios, which has filmed and produced specials for PBS, Discovery Channel, National Geographic, TBS, Science Channel and ABC. Her work has won numerous awards, including two Emmy Awards — one in 2013 for “An Original Duckumentary” and in 2017 for “NATURE: Super Hummingbirds.” She has produced diverse programs on five continents, assembling teams of the greatest talents in wildlife film to work in remote locations. This program is brought to you in partnership with UNC-TV.